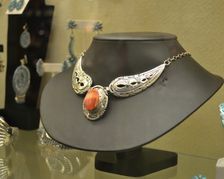 For jewelry lovers, Santa Fe Trails is a true gem. Featuring fine Native American jewelry from New Mexico and Arizona of exceptional quality, their pieces are affordable and truly unique. George Mitchell, an iconic Houston real estate developer and oil and gas industry innovator, was named on Foreign Policy magazine’s list of the top 100 global thinkers.